The Pope owns the hotel where we always stay with our groups. 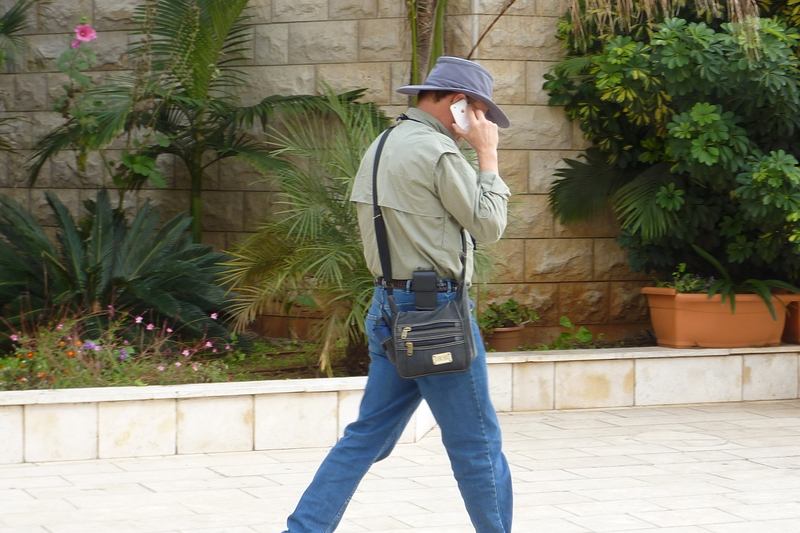 It is the Catholic Center in Jerusalem. Janet and I have stayed at the Notre Dame Ctr. over 130 times. 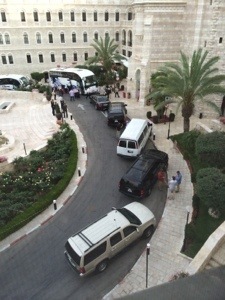 Today when we arrived back from dinner at our favorite Christian restaurant in the Old City we found six Israeli security vehicles in front of the hotel. I’m glad they’re going to take good care of our Holy Father. But I’m also very glad our groups won’t be here when the Pope arrives because the security and the blocked roads and closed cities make for a real difficult pilgrimage. We were here with a group when Pope Benedict arrived. Last time we lost our rooms at the Notre Dame Ctr. because the Pope’s people were moving in. At the last minute we had to find rooms in Jericho. I’m glad we are done and gone five days before the Pope arrives this time. Two weeks ago we had our group in Rome for the canonization. We were very fortunate and our people got to be up close to the Pope and one even touched his hand during the General Audience. We love the Pope and we love the Catholic Church. But to be in the Holy Land when the Pope is here is a logistical nightmare. I’m glad we do not have to subject our pilgrims to that rigamarole. Long live the Pope! Long live the Catholic Church! Long Live the Christians in the Holy Land! Picture taken from our balcony window. We’ve done Raising Daughters, Raising Sons, Loving Your Spouse — and this month we did Priorities in the Family. Jesus is always first. Even if it brings divisions in families, and countries. Priorities are always a matter of juggling. We need to keep family, God, church, work, relaxation, food and sleep all in perspective because all are important. Life is like artwork we are always viewing our life and family as a masterpiece to be shown Sunday in heaven. The one career choice my father made that caused me to be the man I am today. Holy family practiced spirituality is a demonstration for us. Even though God in the flesh Jesus lived a mundane and tedious life to show that being truly human is spiritual under the Lordship of Christ. What is more spiritual, praying the Rosary or changing diapers? Don’t let the parish eat you alive. The father should set the tone for the family and keep the balance between all the priorities. He thereby keeps the family running smooth and teaches the kids how to prioritize. Nothing is more important than the love between husband and a mother and a father. People always ask me, “What are you Steve? “” And I answer I am first a Catholic and a husband and a father. The final test of how well we’ve done with our priorities is on our deathbed. What will we rejoice in? What will we regret? What will we wish we had done less and what we had done more.